I've compared ballet to baseball before. This time, it’s about how the basic framework, or vehicle, remains fairly constant—nine innings played in a proscribed area; a three-act romantic ballet—but what makes a game or a dance interesting are the ever-changing personalities passing through. (I'll admit it: baseball is fundamentally boring without the varied characters at work.) They all bring strengths and weaknesses; it’s this essential humanity that gives the proceedings drama and makes it palatable to watch the same format repeatedly. The revolving cast at ABT this season suddenly feels homegrown again, after years of importing guest artists from around the world to pop in for an R&J or two. And with the recent departure of two Russian ballerinas who represent opposite ends of the spectrum—Diana Vishneva, a fiery, precise mover, and Veronika Part, statuesque and lush—it would seem that an era is ending. Not a decade ago, dancers from Spain and Latin and South America dominated the ranks, such as Carreño, the Corellas, the Cornejos, Gomes, and more, alongside the Russian contingent (add to the above Beloserkovsky and Dvorovenko, who since her ABT retirement has notably distinguished herself as an actor in The Americans). Whipped Cream paired with Simkin, and I heard she was fantastic as Giselle. Shevchenko subbed capably for Gillian Murphy and Part as the female lead in Le Corsaire, doing overtime with four performances. So while these promotions are not a given, it does seem more a formality in the wake of slots opening up with retirements. Other notable season performances and higher visibility dancers include soloist Cassandra Trenary, who seemed to have prominent roles in nearly everything (e.g., The Golden Cockerel, Onegin, and Aftereffect), besides flashing her social dance chops at Midsummer Night Swing; soloist Blaine Hoven, in Whipped Cream and Mozartiana; corps member Catherine Hurlin, whom we recall as little Clara in The Nutcracker a few years back, with growing poise and technique. 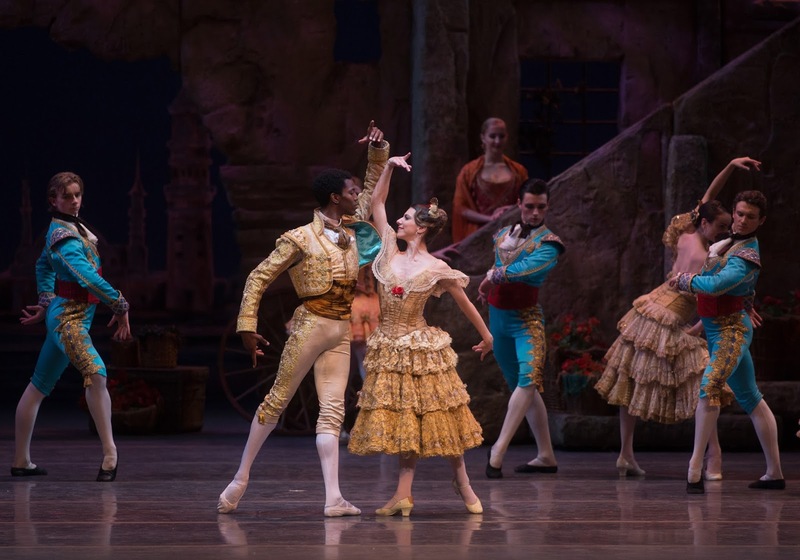 Jeffrey Cirio danced often; notably in Don Quixote with Misty Copeland, where alongside Calvin Royal III as Espada, it dawned on me that the top three roles were filled by non whites. Stella Abrera had a grand season, seemingly flourishing as a principal after seasons of injury and recovery; she sparkled as Princess Tea in Whipped Cream, and was a heart-wrenching Giselle on the anniversary of Gomes’ 20th anniversary with ABT. Joseph Gorak has earned to be seen frequently, with his pristine, artful lines and innate épaulement. He reminds me of a young David Hallberg in many ways—also (unfortunately) in the need to build upper body muscle to be able to hoist women overheard, as he failed to do in the final exit of an otherwise crisp Tchaikovsky Pas de Deux with Isabella Boylston. Speaking of which, Boylston hit her stride this season, endearing herself further with audiences with her courage, commitment, and excellent form; she also seems to have found her match with Lendorf as a frequent partner. I saw them perform Aurora’s Wedding, an augmented act from Ratmansky’s The Sleeping Beauty. While they performed laudably, the piece itself—considered a company premiere—is a lopped off triumphal pageant that carries little of the hard-won dramatic bearing leading up to it, though much of it is still fun to see. And there’s the return of Hallberg, after two years rehabbing a terrible foot injury, after making front-page headlines by joining the Bolshoi, which defied conventional knowledge and tropes about that company’s style, versus his own, more Mariinsky-like classical sensibility. Seeing him in action again was like seeing a unicorn. His flexibility and ballon remain remarkable, his line exquisite, his upper body strength now reliable. And he inhabits his roles more, rather than wearing them externally. Perhaps the injury did have a silver lining, by causing some soul searching and retraining. In fact he is writing a book on the topic, so we can read firsthand his thoughts. While one dancer’s departure means another’s entrance, some dancers, like Hallberg, simply cannot be replaced. At least we can look forward to more performances by him, as well as the numerous advancing dancers who have risen through ABT's ranks.